Since agricultural activities are highly influenced by the climate variability, employing relevant climate information for promoting agricultural production and food security is highly required. 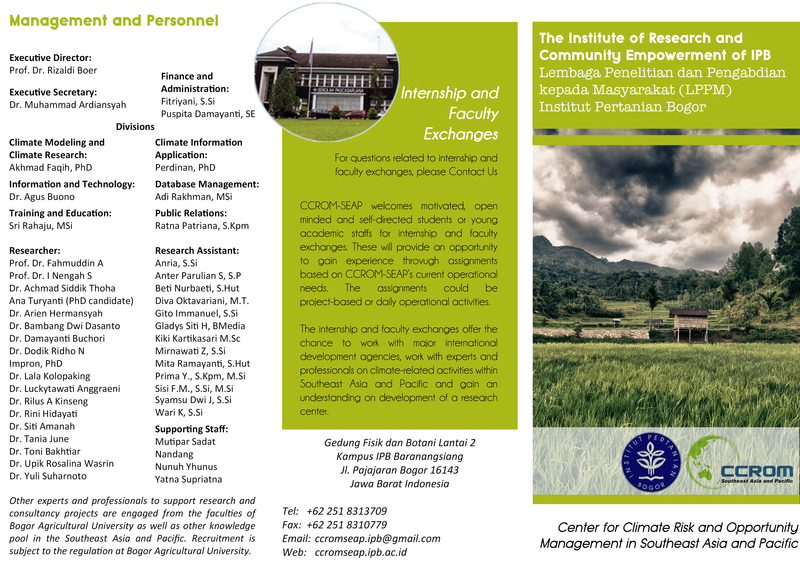 The centre conduct research, education and training in this sector in order to increase the capacity of decision makers and farming communities to tackle the challenges of climate risk and strengthen the linkage and communication among the scientific community, farmers/society and policy makers. Climate variability and climate change pose risk to the human health such as the increase of mosquito-borne infections i.e. malaria and dengue fever and other vector-borne infections i.e. diarrhea and cholera. It is therefore crucial to ensure the integration of climate considerations into the development of the health sector in South East Asia and Pacific as it will severely impede the achievement of goals in health sector. Climate risk and opportunity management plays vital role to support many kinds of economic activity and livelihoods. Proactively managing hydro meteorological shocks will not only help stem losses, but also increase the depelovmental resiliency of communities and societics in the South East Asia and Pacific region. Supply and management of water resources is highly affected by the seasonal climate fluctuatuins. Floods and drought are the two problems associated with the lack of knowledge on understanding the chaning rainfall pattern, managing the water supply and sustaining the forest cover along the watershed and the protected areas. Water demand as a consequence of population growth, urbanization, industrial development and agricultural requirement has ezacerbated the problem of supplying water to fullfill the demand. The combination of climate uncertainty and water demand has stressed the need of employing best climete information available for planning water management to deal with the above problems, and achieve "climate-smart" water management. The occurrences of extreme climate events have caused serious impact in many sectors, in other hand historical data shows that global climate has already changed. In the future it predicted that the intensity and the frequency of these extreme climate events may increase. One of the causes concerning with this phenomenon is the increasing of GHG\'s which causing the global warming. Therefore, reducing GHG\'s emission through several actions become important agenda dealing with the global warming effect. 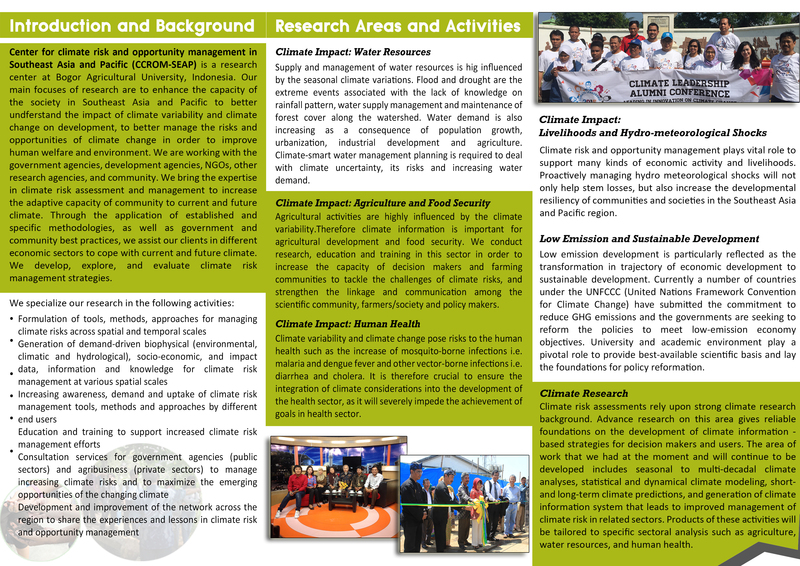 Mitigation of Climate Change is activities which have objective to reduce the risk of climate change through minimize the GHG\'s emission levels. In context of Indonesia, it was stated that Government of Indonesia have commitment to reduce GHG\'s during 10 years with 26% for National scale target and 41% for International target with support from International in terms of mitigation.